These in the hoop bibs are entirely constructed in the hoop; no additional sewing machine or hand stitching required. The bib has background quilting stitches, all done in the hoop. There are two versions included in your download: one for girls with a ricrac edge; one for boys with double topstitching. The elephant is appliqued and the tail is fringed. If you have never stitched fringe, you will be surprised by how easy it is. We will show you how to do it. The ear is 3 D and stitched in a very quick separate hooping. Closure is accomplished with a plastic snap. Combine this project with some of our other in the hoop baby designs for a one of a kind gift for a baby shower. You are receiving 5 stitch files with your download: one bib for girl; one bib for boy; two bibs, each without any front design, but with the ricrac or topstitching. Earn 9 points at checkout OR buy this item for 170 points. These in the hoop bibs are entirely constructed in the hoop; no additional sewing machine or hand stitching required. The bib has background quilting stitches, all done in the hoop. There are two versions included in your download: one for girls with a ricrac edge; one for boys with double topstitching. The elephant is appliqued and the tail is fringed. If you have never stitched fringe, you will be surprised by how easy it is. We will show you how to do it. The ear is 3 D and stitched in a very quick separate hooping. Closure is accomplished with a plastic snap. Combine this project with some of our other in the hoop baby designs for a one of a kind gift for a baby shower. You are receiving 5 stitch files with your download: one bib for girl; one bib for boy; two bibs, each without any front design, but with the ricrac or topstitching. Baby Boy Gift Bag - 2 Sizes! 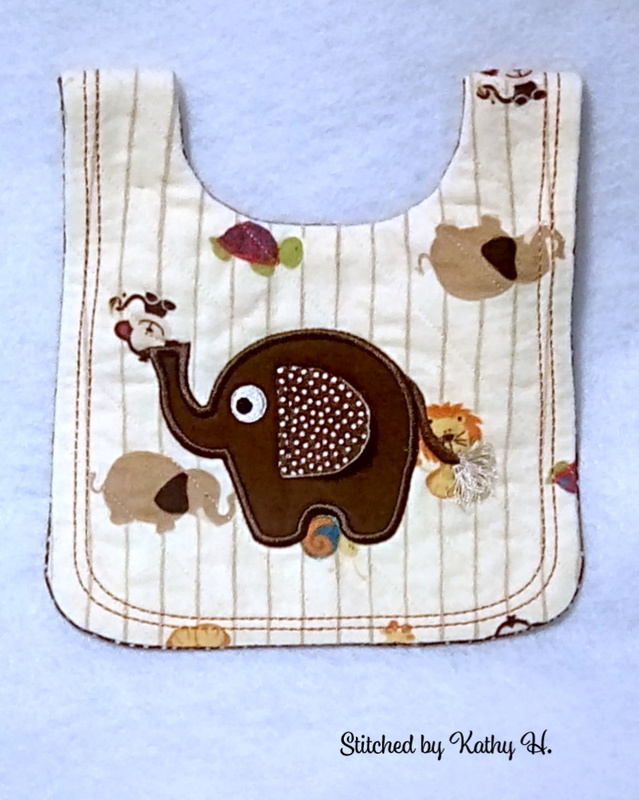 Bibs and Burp Pads Set, Girls - 10 Designs!